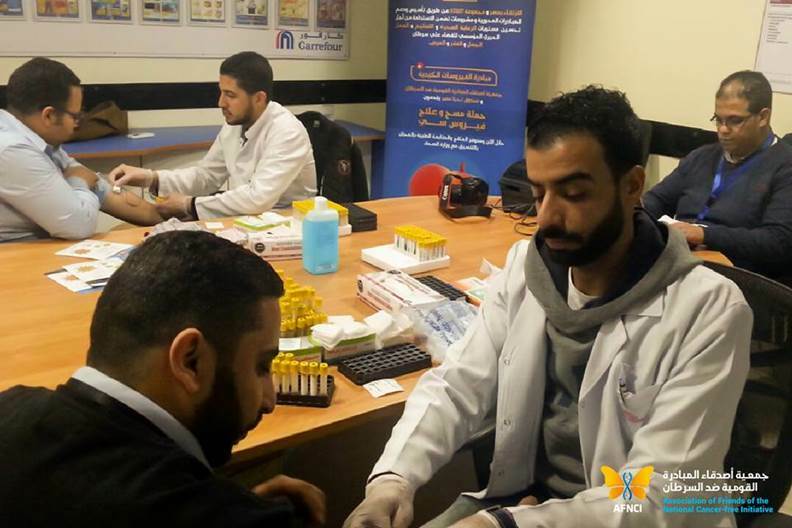 Within its quest to contribute to the National virus C screening and treatment campaign to eliminate the spread of the disease, AFNCI conducts screening campaigns for different sectors of the society, in cooperation with the Ministry of Health and Long Live Egypt Fund. Currently AFNCI is conducting a screening campaign in Carrefour branches inside and outside Cairo. AFNCI started by screening the employees of Al-Obour branch, and handed them information booklets about the disease and how to prevent it. Yasser Anter, one of Al-Obour Carrefour staff expressed his gratitude to AFNCI with these words” they are really concerned about our health, today I learned about disease prevention means and received an awareness booklet useful for my children and my family. It is noteworthy that the Association will provide free treatment and follow up for infected patients, in cooperation with the Ministry of Health. The mission of AFNCI stipulates that it will pursue to establish and support strategic initiatives aiming to improve the levels of comprehensive healthcare provided to Egypt’s citizens since the country’s real wealth depends on its citizens’ health, so that the new generations would be capable to build a bright future for Egypt.